There are few more frustrating aspects of being loyal to an airline or a global alliance than the inability to redeem the miles you've worked hard to earn for what are known as award flights. There is, however, something even worse: Airlines choosing to send out flights with empty seats rather than make some of them available for mileage redemption. I'm referring to saver award levels, not those that require double or triple miles. As it is, round-trip saver awards require as many as hundreds of thousands of miles these days. 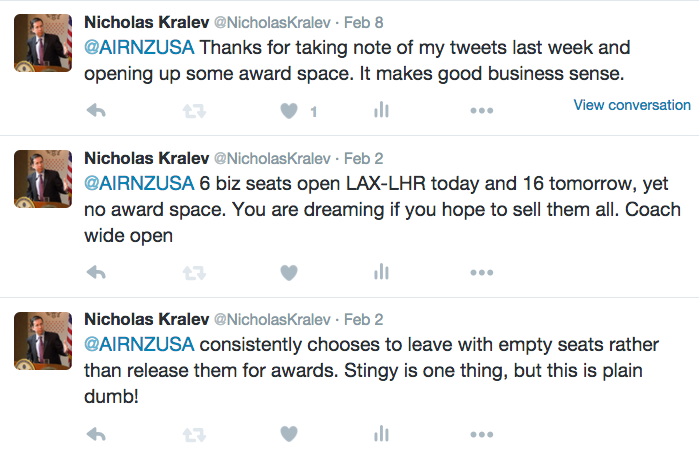 Last week, I called out Air New Zealand, one of the worst offenders -- particularly in Business Class -- on Twitter. With a few hours left until its Los Angeles-London flight on Feb. 2, there were six unsold Business seats. Yet not one of them was available on miles. 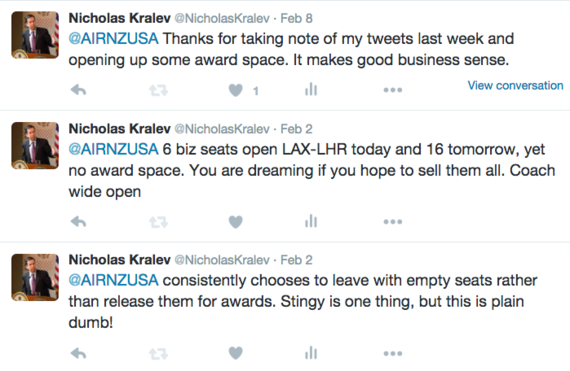 On the same flight the next day, 16 Business seats were open -- again, no award space. The coach cabin was wide open on both days, so the carrier wasn't protecting Business seats to accommodate a so-called oversell in economy. I'm never impolite on Twitter, but I'd had it with Air New Zealand. I haven't seen award space in Business Class on any of its North American flights in years. Last year, I flew the airline several times on different routes on revenue tickets. Out of curiosity, several days before the flights, I looked at the seat maps. On most of them, there were several empty Business Class seats. A seat map is never a full reflection of actually sold inventory, but it gives a good idea. I set up alerts on Expertflyer, an essential tool for frequent travelers, which sends you an e-mail when a seat opens up on a certain flight. Award space never opened up on any of my Air New Zealand flights. Then on half of them, sitting in the cabin on my travel day, I watched the plane take off with empty seats. On one, only a third of the cabin was occupied. This has been happening for years. My conclusion isn't based on anecdotal evidence or deduction, but on hard facts and numbers. You can set up an Expertflyer alert as soon as a flight opens for sale -- usually, about 11 months out -- so it's easy to prove that an airline never released award space. Many carriers don't open space on certain routes at all. Then there is Singapore Airlines, which doesn't make award seats in Business and First Class available to its Star Alliance partners on any of its long-haul flights. Period. Yes, I've watched its planes depart with empty seats, too. Among U.S. carriers, American Airlines has long been extremely stingy with award space on intercontinental flights. There have often been no seats on certain routes at all. Until now. In recent weeks, award space on American has improved significantly in premium cabins. I'm not sure how much my tweets had to do with it, but Air New Zealand opened up seats on some North American flights as well. At least they "liked" my tweet thanking them for the gesture, so I know they saw it. Allowing mileage redemption for seats when it's clear they won't be sold just makes good business sense. I don't know why this is so difficult for airlines to figure out, but it seems some of them are slowly waking up to it. Beyond making loyal customers happy and generating good will and return business, it helps frequent-flier programs offload miles, which weigh on their books as an accounting liability when unused. When I was writing "Decoding Air Travel," I mentioned the problem to Wally Mariani, then-vice president for the Americas at Qantas, which isn't generous with award space, either, though it's possible to find seats sometimes. He said the computer models the airline used to determine if and how much space to release wasn't perfect and suggested that customers call to alert agents when a cabin is wide open, so inventory management can review the flight. I don't believe he ever told his subordinates -- or anyone else. Perhaps airlines should give those rocket-science-complex computer models of theirs another look. What's good for customers can also be good for business.